In the fall and early winter of 1888, Vincent van Gogh and Paul Gauguin shared a studio in a yellow house in the south of France. Result? Much painting and whoring and, at the end, a meltdown and an ear-slicing. Gayford (co-editor of the Grove Book of Art Writing and chief art critic for Bloomberg News) has crafted a brisk, engaging narrative about the brief co-habitation of two of the world’s most celebrated painters. Although the author focuses more frequently on the mercurial van Gogh and his varied vagaries, Gauguin comes off well, and the many reproductions offered here of the works he produced during his time with van Gogh form an eloquent testimony to his genius. Gauguin also emerges as a tolerant man who recognized the prodigious and prolific talent of his friend and endured the tortured Dutchman as long as possible. Things started well that remarkable fall. The two took walks, painted common subjects, visited local museums, read books together (Zola, for instance), visited the local prostitutes regularly, agreed on the splendors of Delacroix, argued about the merits of other painters. Gauguin’s career accelerated during the period (he sold several paintings through the offices of Theo van Gogh, the painter’s brother), occasioning some anxiety in Vincent, who was not doing so well. The bonhomie eventually weakened, and when van Gogh sliced off his ear (or a part thereof), Gauguin, after helping rescue his friend, entrained for Paris; the two never saw each other again. Gayford’s principal interest is with the paintings. He discusses the major ones (and some of the minor) with great care and sensitivity and sees in the artists’ work some cross-fertilization. 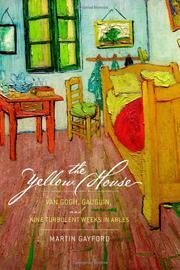 The author ends with the deaths of all involved and speculates that van Gogh suffered from bipolar disorder. Lucid and learned and propelled by a piercing dramatic irony.